What makes each of these bathrooms timeless for me is that there is a contemporary element mixed with each of them, no matter which style, period or material . 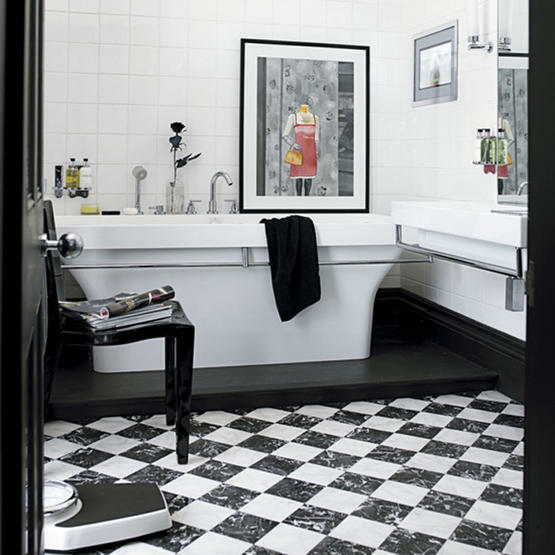 Each bathroom is simple yet has its own distinct personality and I like them all. 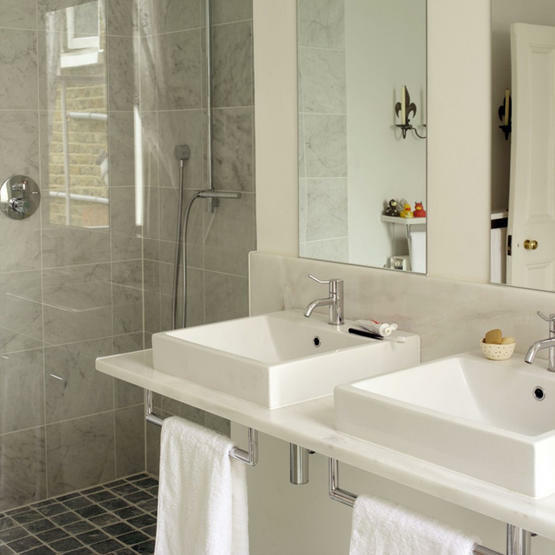 Do you think these bathrooms will look as great in 10 years? 30 years? 50 years? 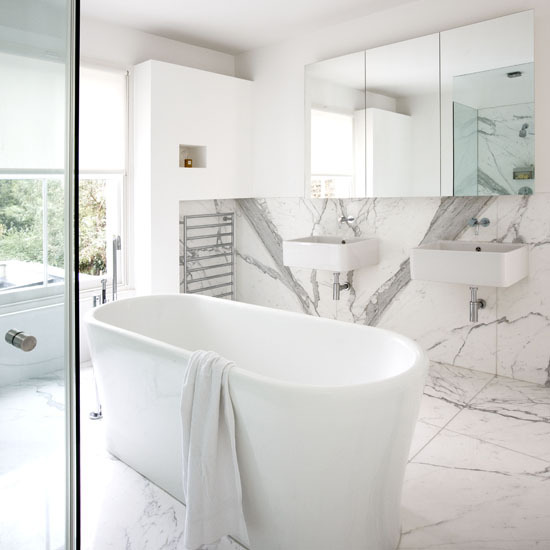 Clean and simple lines of the tub, sinks and mirrors with a gorgeous backdrop of dynamic marble – the only source of pattern here – shines in all of this natural light. 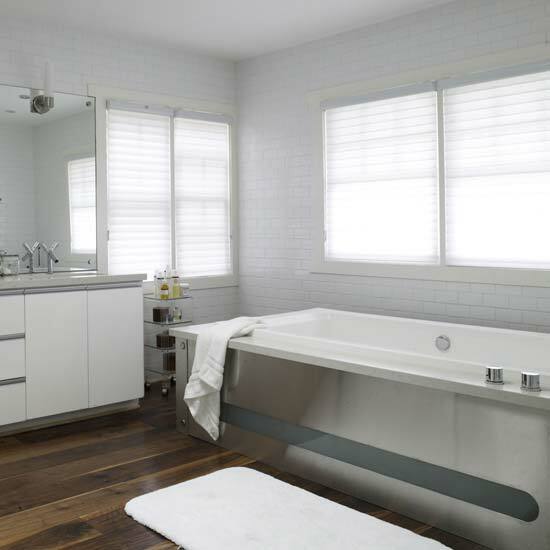 Stainless steel as a tub surround is a unique application, paired with white subway tiles and wood floors keep this bathroom from feeling sterile. All modern with a touch of stone and wood with one spectacular crystal chandelier. Country bathroom with rustic tiles, wood panelled doors and trim and wrought iron hinges juxtapose well with a modern chair and faucet. Classic black and white are always a perfect pair. The modern tub on the contrasting black deck with chrome accents is very crisp. 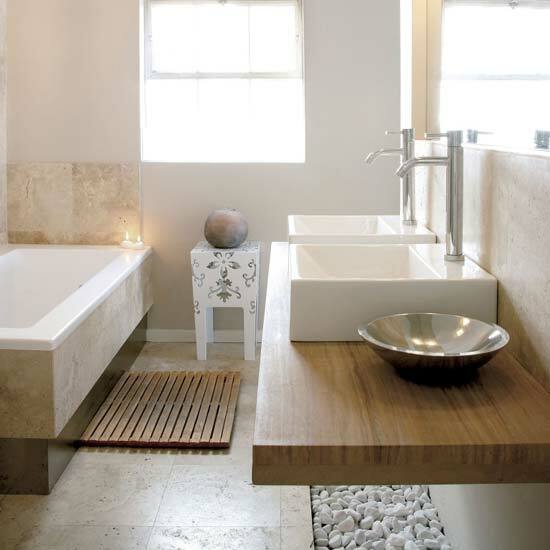 Natural beauty in this bathroom is created with warm travertine throughout, accents of natural wood and modern fixtures. The run of white river stones in floor is inspired. Modern his and her sinks with chrome towel bars are great space savers and the gray marble wall tiles with the gray slate shower floor is a great backdrop. 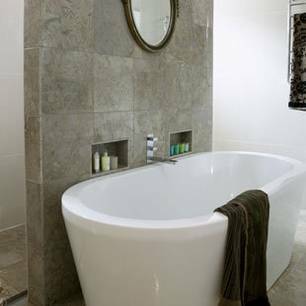 Running the stone from the floor up the wall behind freestanding modern tub is simple yet effective. 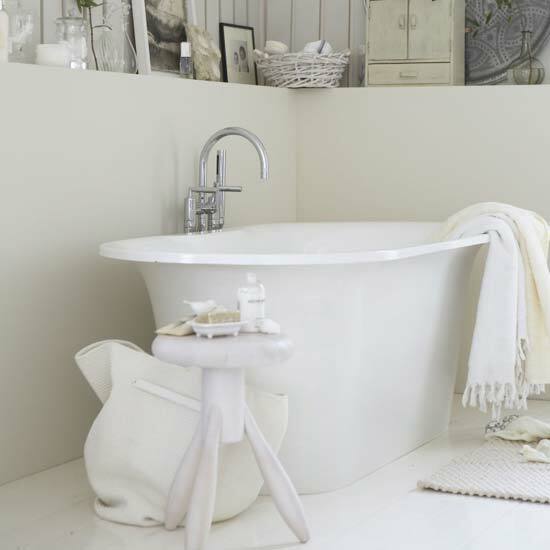 A little European flavour makes this bathroom a beauty. I love old with new. 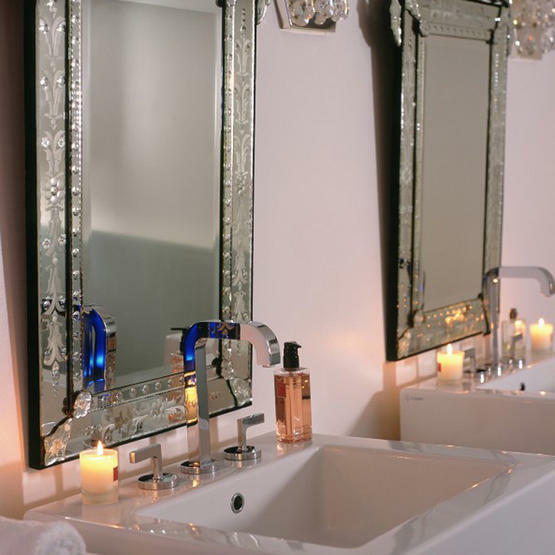 A pair of vintage venetian mirrors is fabulous with modern sinks and faucets. I love details! All of the fixed elements of this bathroom are contemporary yet zen, and the accessories, while fun, are easily changed in the future. 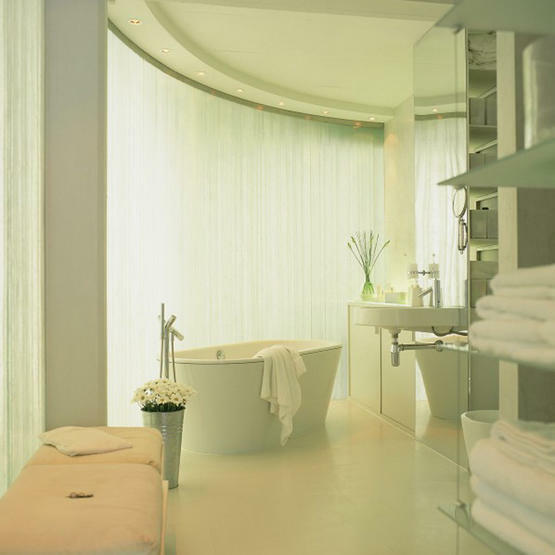 All white works in bathrooms with an abundance of natural light such as this one. The narrow built in shelf around the tub is a great idea for toiletries. Getting the background right is essential, and then you can change the atmosphere with great accessories such as the rug and bench here. Back to basics – all white but with great lines and hits of chrome. This has a modern Hollywood feel with the curved windows lined in an ethereal sheer curtain. This is an excellent example of how a simple thing such as the choice of grout colur can affect the overall look of a bathroom. 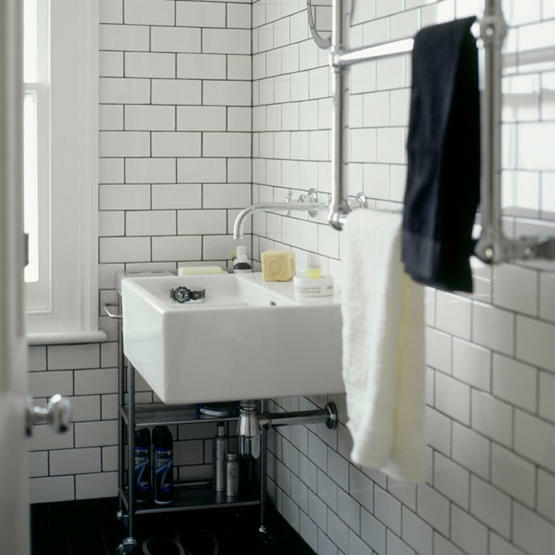 (Compare the similar subway tiles with a white grout instead in the second photo at top.) Contrast. My name is Sue Womersley and I am an Interior Decorator with a design studio located in Steveston, BC. I love helping my clients love their space and my popular 2 hour consultation is the perfect solution to your decorating questions. Love the new layout, and glad to see a new post. Keep up with the great observations!